Kallil (കല്ലിൽ) cave temple, a Jain temple, is located in Methala (മേത്തല) village, Koovappady (കൂവപ്പാടി) taluk, Ernakulam (എറണാകുളം) District, Kerala, India PIN 683545 and forms part of Asamannoor (അശമന്നൂർ) Panchayat. The Methla town in Trissur district should not be confused with this village. The cave temple is located 42 km towards East from district head quarters Ernakulam. 10 km from Koovappady. 22 km away from Kalady (കാലടി) (birth place St. Sankaracharya (ശങ്കരാചാര്യാ), 217 km from state capital Thiruvananthapuram. Kallil means 'in stone' in Malayalam language. The geographical coordinates of Mathala are 10.112921°N Lattitude and 76.5517132°E Longitude. The altitude / elevation is 30 m (100 feet). According to the 2011 census of India, Asamannoor has 4714 households and the population is 19311 (Male 9574, Female 9737) . The literacy rate of the village is 84.57%. The temple is owned by the Kallil Pisharody (കല്ലിൽ പിഷാരോടി) family. The overall administrative control of the temple remains with the present Karanavar (കാരണവർ) of the family and all its properties maintained by 'Chenkottukonam Sree Ramadasashramam' (സെൻകോട്ടുക്കോണം ശ്രീ രാമദാസ് ആശ്രമം). But all that retrieved back due to some hassle between local people and Ashram authorities. The monument is protected by Archaeological Survey of India (ASI). Kallil Bhagavathy (കല്ലിൽ ഭഗവതി), is natural cavern where legend, myth and history meet. It is considered one among prime ancient Jain temples in Kerala. 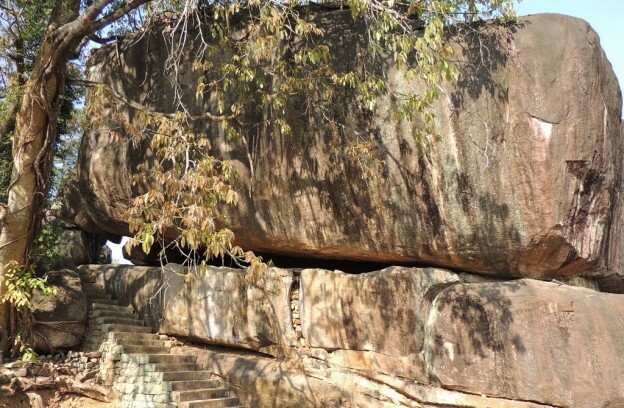 It is located right in the middle of a jungle and it is as wide as 28 acres, It is located beneath the huge monolith rock measuring a 75 feet in length, 45 feet in width and 25 feet in height and it stands sans the support on the ground. The flight of 120 steps leads to the cave temple. It is believed that the inception of the temple might date back to third century B.C.. Scholars also agree with this theory. The Jain cave temple is now converted and dedicated to Bhagavathy (a ferocious form of Mahishasurmardini i.e., form of Shakti). Bhagavathy is the prime deity of this cave temple. 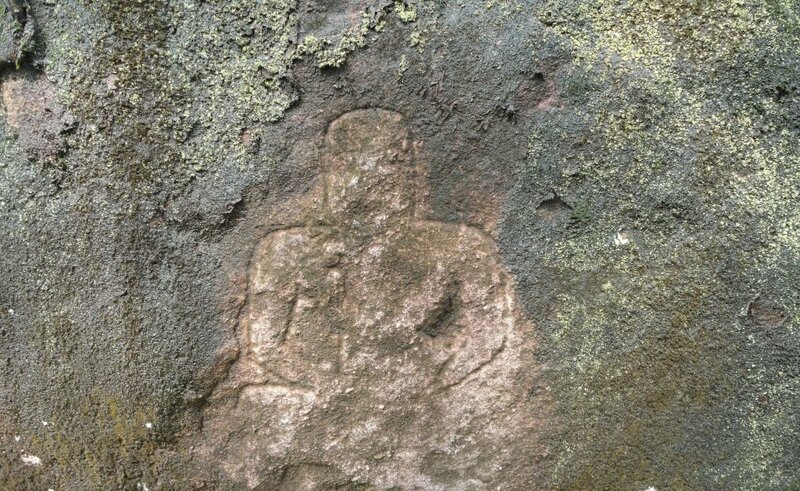 The bas relief image of Lord Brahma is sculpted on top of the rock. It is believed that the rock is standing stable on its position due to the grace of Bhagavathy. The cave temple also houses images of Parshvanatha (also known as Parshva), the twenty-third Tirthankara and Mahavira, (also known as Vardhamāna), the twenty-fourth and last Jain Tirthankara and Padmāvatī the protective goddess or shashan devi of Lord Parshvanatha. The Jain monks might have frequented this cave and performed religious practices. The worship of Bhagavathi is popular and widespread in Kerala, Goa and Konkan. The Bhagavathi worship is also a part of Theyyam (Theyyattam ) (തെയ്യം) (spirit) worship, a popular ritual form of worship of North Malabar in Kerala. The term theyyam is a corrupt form of Dhaivam or God. It is also popular ritual art form of northern Kerala especially prevalent in the traditional Kolathunadu (the present Kannur and Kasargod Districts). Keralopathy, the popular historical book cites about the sanctioning of the festival such as Kaliyattam (i.e., Theyyattam or Daivattam) by Saint. Parasurama to the Keralites. The responsibility of performing Theyyam dance is assigned, by the saint, with the indigenous communities like Panan, Velan, Vannan and Malayan and Velan. Theyyam dancers are referred to in the sangam literature. The dancer, as per Sangam tradition, was "employed by the mothers of love born girls to exercise the malignant spirits from their daughters." The rituals of Sangam tradition described in Tamil Sangam literature (including Sangam commentaries are being totally observed by Velan and other dancing traditions. The Sangam literature describes Ezhimalai, the hilly region ruled by Udayan Venmon Nannan. It is believed that Ezhimalai region is now known as the present Kolathunadu near Payyannur. Hence it is believed that the Tamil Sangam Age cult still continues with regional variations. Until the medieval period the people were almost Buddhists in mid and south Kerala. It will be surprising to learn that most of the popular Hindu temples in Kerala including Vaikam were originally Mahayana shrines and Buddhist Viharas, nunneries and monasteries. It is believed that Mahayana Boddhisatva idols are converted to gods Hindu pantheon i.e, Muruga, Ayyappa and Kuttikrishna in caste Hindnu temples. The Vajrayana Siddhas and Tara Devis began to be increasingly called as Tozhuvans and Hindu Bhagavatis in the post middle ages. Tara Devi turned from Buddhist Vajrayana Siddhi to Bhagavathi (Durga). In the 16th century Chennas wrote Tantra Samuchayam and absorbed the Tantric Buddhist deities into the Tantric Brahmanic mode, eventually completing the take over. The scholars believe that Tantric Vajrayana (tantric corpus of Buddhism) practice within the Buddhism might have led to Bhagavathy cult. Since Buddhism wiped out in Kerala i.e., in the dominant matriarchial setting, the Tara cult might have transformed into Sakthi cult and Spirit worship. The Brahmanical Hinduism preached Varna (caste) system and the untouchability practice was enforced on the Avarnas including the current Scheduled Castes and Other Backward Classes between the 8th and 12th century in Kerala. The Avaranas were prohibited from walking on the roads surrounding the temple. The cast Hindus (Brahminical Hinduism) might have enforced untouchability out of fear over Avaranas (original Buddhists who owned the temple i.e., Buddhist Viharas, nunneries and monasteries) and if Avaranas are permitted to access into the Hindu temples, they might recapture their own Buddhist Viharas, nunneries and monasteries. Daily Poojas are performed to the deity as per Kerala Agamas. The temple remin closed after midday (noon) and no poojas after sunset. The annual festival of this temple is conducted for eight days commencing from the 'Karthika day' in Vrischikam month or Karthikai month (November–December). The idol is taken around on a female elephant for procession. By Road: To reach the temple one has to travel a distance of about 2 km from Odakkali, on the Aluva Munnar Road and 10 km from Perumbavoor. Perumbavoor is the nearest town. The Bhagavathi cult. Tulu Research. January 16, 2008.